Muktinath is a pilgrimage shrine located 140 miles from Kathmandu in the snow clad Himalayas. It is located near the Gandaki river famous for the Salagrama stones. River Gandaki is also known as Narayani or Salagrami. 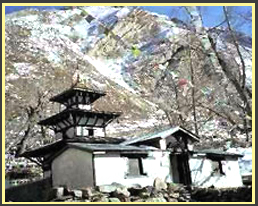 Muktinath is also one of the 51 Sakthi Peethams of India. About 16 miles from Muktinath is the Damodara Kundam, the source of this river. 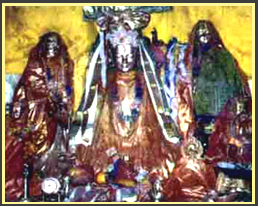 The Salagrama stones held in worship are found in this part of Nepal. There is no firm agreement on the whereabouts of the Sree Vaishnava Divya Desam Tiruchaalagramam. One school of thought considers Muktinath in the snow clad Himalayas in Nepal to be Salagramam, while another considers the bank of the Gandaki river enroute to Muktinath from Kathmandu as Tiruchaalagraamam. From Delhi, conducted tours are available to Salagram. However, if you want to go on your own, you can go to Sunoli in India - Nepal Border via Gorakhpur, either by train upto Gorakhpur or by bus to Sunoli directly. From Sunoli you have to cross the border by walk or by rickshaw. Then you can take a bus to Pokhara which cost around Rs 150/- nepali rupees. This journey takes around 9 hours. From Pokhara you can go by air to Jomsom. This takes around 20 minutes and costs Rs 1200/-approx.Please go by Shangrila Air and not by Royal Nepal Airlines. From Jomsom Muktinath(Salagram) is around 22km, which you have to trek. The time for this trek depends on how old or young you are and can vary from 7 hours to 10 hours. From Pokhara you can go by bus to a place known as Beni which takes 5 hrs by bus and from there you can trek to Salagram. But this trekking takes around 5 - 6 days. c) you can hear the river Saraswati flowing under the earth. (It is not known how Saraswati came here, but the panditji there claims that she descended to earth through this place). From Muktinath, Damodar kund is around 2 days trekking , but there are no food available on the way and one has to go prepared. If you go on your own, food will be a problem right from Jom som till you reach salagram. But you can enjoy nature, and you can look for salagram in river kandaki. Or else you buy salagram from the shops enroute. Best season is during March- April. Please avoid rainy season from June - July. When you are in Nepal you can also visit Janakpur. Theertham - Chakra Theertham, Kandaki river. Located within Nepal. Nepal Government Permit required.110 miles from Nepal State Railway Station(Amlagunj). Very cold and snow-bound region.